Unlike many off the shelf systems, the Expo Tracker Registration System provides flexible, fast, efficient, and secure on-site registration. We use Self-Service Kiosks for quick, efficient badge printing and new on-site registrations. The Management Portal provides a very easy to use on-site registration system for temporary registration staff. Financial processing is secure and immediate using built-in credit card readers. Detailed financial reports make balancing each cashier quick and accurate. Pre-conference reminder emails with bar codes and readers onsite create incredibly fast express badge printing! Some Expo Tracker customers use their in-house association management systems to provide online registration for their conferences and expositions. Expo Tracker offers direct integration with our badge printing systems and on-site equipment. These processes give show management complete flexibility to create a custom plastic card or paper name badge and continue to use their existing systems. The Expo Tracker Badge Printing System includes a bulk production module that sorts by multiple criteria and produces multiple items simultaneously, for example, paper name badges/plastic lead cards, name badges/welcome letters, or other combinations of customized items. 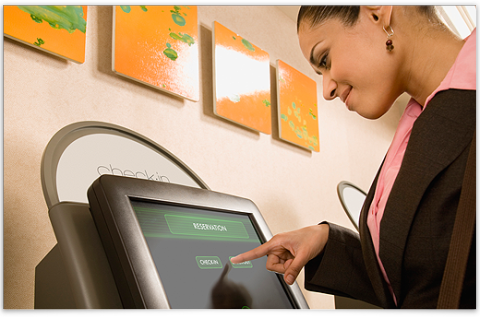 On-site self-registration kiosks and managed stations offer a smooth and efficient process. Name badges in multiple, custom sizes - 4" x 6" badges provide extra-large font, easy to read bar codes and multiple logo opportunities. Expo Tracker’s on-site equipment consists of 20" all-in-one touch-screen computers, Zebra Thermal Printers, and Zebra Card Printers/Encoders. We test all of our equipment to ensure it is reliable and portrays a professional image on show management and their sponsors.